This CS-Cart modification can be a good contribution to online stores selling products that can have fractional value quantity. The ability for an administrator to specify the possible fractional values of the quantity. In the admin back-end on product editing page administrator will be able to specify fractional Minimum order quantity (e.g. 0.1), Maximum order quantity, Quantity step, and List quantity count. 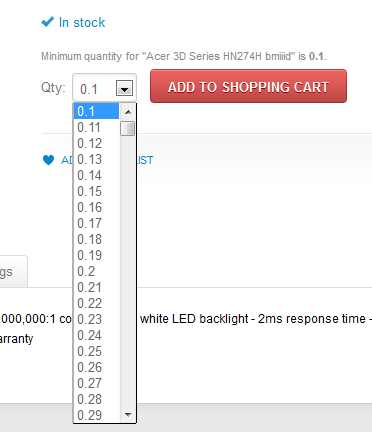 The ability for customers to choose the necessary fractional value from the drop-down list on product details page. The initial cost of this modification was $320. We are ready to implement this modification for $240. This modification requires core files change.